You are here: Home / OS / Android / How to Share Internet from Android Phone via USB? You can share your mobile internet via WiFi, Bluetooth or USB. 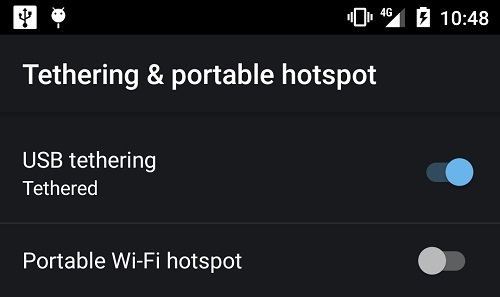 Most of the rooted and non-rooted Android phones now comes with Portable Hotspot and Tethering option built-in. Some of them supports sharing your mobile’s internet using all of them or supports only specific ways. I’m using AOSiP Android 5.1.1 on my Nexus 5 and it has all the ways to share internet. Also my Galaxy S5 Mini supports WiFi Hotspot and USB Tethering, but no bluetooth tethering support. If you have been looking how to use your mobile internet on your PC via USB cable, follow the simple steps below. Make sure you have all the drivers installed. If you don’t have the device driver installed, try searching “Universal Naked Driver for Android” and install it in your computer. The package has drivers for most of the Android phones. This will automatically connect your computer to the internet, takes just few moments to prepare the connection. And, the speed I’m getting is good enough for me. One small bit of issue, that it creates a new connection each time you connect your phone. It doesn’t use the previous connection it created.